Missouri Senate Bill 635 states that high school students must receive thirty minutes of CPR instruction and training in the proper performance of the Heimlich maneuver. The Heart of Missouri RPDC has the supplies necessary to provide schools with a CPR training kit that can be loaned out to meet the Missouri state standards. The CPR in Schools Training Kit is a classroom-based program designed to teach Hands-Only CPR and AED use in one class period. 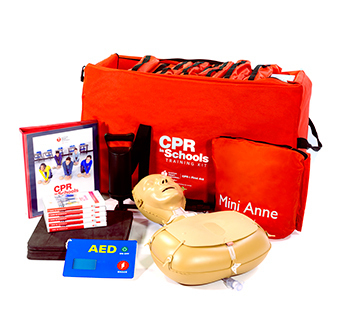 This kit contains everything needed to facilitate a CPR in Schools training class for 10 to 20 students at once, and the process can easily be repeated to train an entire class, a grade, or even an entire school. Because the mannequins are re-usable, one CPR in Schools Training Kit can train hundreds of students. Call the Heart of Missouri RPDC at 573-882-0859 to reserve your CPR in Schools Training Kit today!